Worried with the dresses for your wedding? Leave it to David & Rachel Haute Couture to look for the best outfit on your special day. They offer a wide range of designs and needless to say they also provide as per customer preferences. Feel free to make an appointment with their in-house designer Kenny Ladaga. He is very passionate fashion designer, won 1st place at MODA Mindanao Pageant, SM City Sagala 1st runner up and many more achievements for the past years. His designs are modern, couture quality and elegant. Rest assured, you will be amazed of his creations. 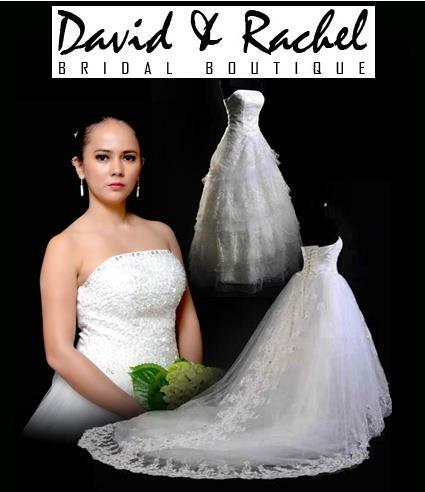 Come and try their diverse collection of bridal couture,designer wedding dresses, ready-to-wear wedding gowns & dresses, bridesmaid & evening dresses, debut dresses, flower girl dresses and stunning jewellery & accessories all under the one roof at David & Rachel Maya St. Ecoland Davao City (in front of Casa Leticia Inn. near John Paul II College of Davao). They are also specialized in made to order and rental dresses for any occassion such as evening dress,prom dress,debut gown, wedding gown, cocktail dress and ready to wear clothes.